The following 1999 email from Charles Cardona was found in former Dolphin 24 webmaster Jim Huxford's old internet files. I have a S&S Pacific Dolphin 24 that I recently acquired. It is such a nice boat and sails quite well. It is number 257 made in 1976 by Pacific Dolphin. It has an outboard well and a Honda 4-stroke 10 hp. I have a picture of it - http://www.owlnet.com/chaz/boat2.JPG. 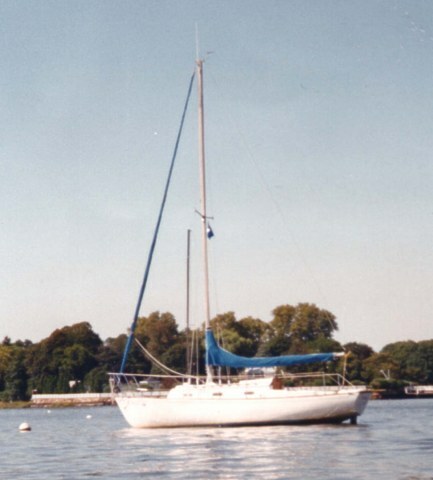 It has roller furling Genoa, electric head and it (is) much bigger and quite sturdily built. We have been trying to find this boat and came close, we think, a couple of times. Charlie sold this boat to a Steve Letterman in this area. Steve also sold the boat...Stay tuned.